As we just started 2018, it’s been a tradition in the past few years to pause for a moment and take a look back. This was definitely an interesting year, both in good and bad ways, and definitely a year of changes. As such I must admit that I am looking forward to 2018 being a hopefully more stable year. Change is exciting, but it can also be taxing. On a later call, I learned that I would be working under Tim Heuer, a long time friend and someone I respect tremendously in our industry. That was one more point for Microsoft. I requested to interview around the Build conference timeframe, since I was going to be in Seattle anyway. That proved impossible however because everyone was so busy. Microsoft offered to bring me back to Seattle for the interview, which I accepted with gratitude because I was not feeling like doing all the interviews online. At Build, I had the occasion to take advice from a few close friends from the community as well as some friends who had recently joined the CDA team. One week later at the Techorama conference in Belgium, I had the chance to talk quickly with Scott Guthrie, whom I have known since 2007, and his CVP of Azure Growth Charlotte Yarkoni, who was instrumental in the creation of the Cloud Developer Advocates. Both were very enthusiastic and I received some great feedback and was really pumped to go interview to Redmond. The interviews went great, I spoke to people whom I either knew in person, or knew of, and I think that everyone was excited about the prospect. We finished the day with dinner and ice cream in Redmond with Scott Cate, Tim Heuer and James Clarke. I think what I will keep from this day is the feeling that everyone was rooting for me, from the AVIS rental car clerk to the Redmond Marriott desk lady, to the receptionists and everyone I talked to. I am glad I decided to go all the way to Redmond for the interview, it was really worth it. On the way back home, I noticed that whenever people asked me why I had been in Seattle, I was starting to talk as “we” whenever I was mentioning the team. That’s when I realized that I had almost taken my decision. While I always loved the team I worked with at IdentityMine and then Valorem, I have to admit that I felt ready for a change after more than 8 years. As such the call came at the right time, and the fact that the job is pretty much the perfect job for me was really a fantastic event. 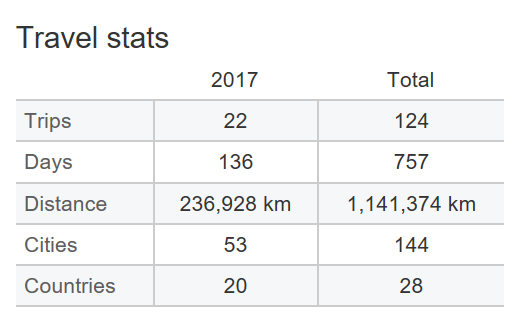 2017 continued the trend of more travel, more people to talk to about coding. In fact it is the year I traveled the most, ever. Since I joined Microsoft, I had the chance to speak and meet coders in Redmond, Amsterdam, Singapore, Koeln, Lima, Hyderabad, Malmo, Sofia, Toronto and Zurich. My center of interest remains around Xamarin, Windows, MVVM, XAML, Visual Studio, and more Azure gets added to the mix as I go of course. Honestly I am really excited about “the cloud”. In the past few years as a Regional Director, I kept thinking that I should really invest time into cloud computing and especially Azure. Well what better occasion than this? Ever since August I started learning what the various services are, and which ones are the most relevant to my area of expertise. I am really digging serverless computing, app services, trying to find my way through the various kinds of data services we have, and making sure I am not missing something important on the way. I predict more of this for 2018 and trying to keep up with all the cool new stuff that the teams are creating. The chance to speak to MVPs in Lima (my first trip to Peru ever), in Hyderabad (my first trip to India since 2007!) and in Paris (with the group with which my MVP adventure started 11 years ago). The busy season of 2018 will start early, with a trip to Redmond in the second week of January to meet up with my Cloud Developer Advocate colleagues. It will also be my first trip to campus since August 17, which is unfortunate (but there was no other way because of busy fall schedule). In general I would like to be in Redmond more often, so that I can speak to the teams there and take advantage of the Channel 9 studio, etc. 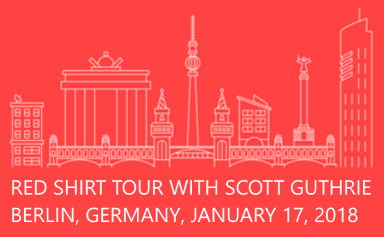 Right after I come back from Redmond to Europe, Scott Guthrie will be on tour again with four European dates. 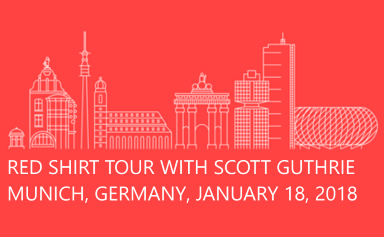 I will follow him on the tour and should present some Xamarin demos at this occasion (though the schedule is subject to change, so we’ll see :) You can click on the images below to get more information! 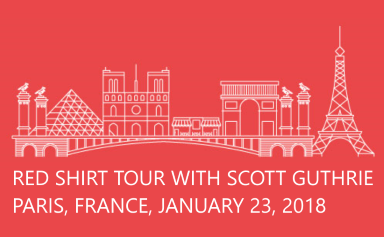 In Paris I will also talk at a local Meetup the day before the Red Shirt Tour event (the meetup is on the 22nd of January). I will present about Azure Functions, more specifically how to use them to build an API suitable for cross platform applications. In Birmingham, I will also be a part of the TechSummit and present my “Cross platform development with Xamarin” session. Make sure to come say hi if you are at any one of these events!! More events will follow, so stay tuned to my Twitter feed for more events in February. I can’t wait to present the latest Xamarin and Azure news to you and get in touch with all of you! Very happy new year and as always Happy Coding!! Comments for 2017 in review&#8230; welcome 2018!